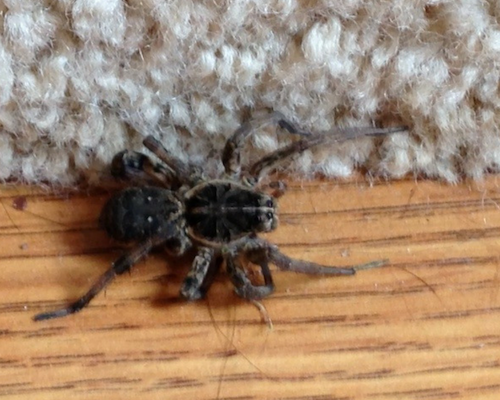 Wolf spiders come in a variety of sizes, but some are up to 2 inches in length. They are also hairy and sometimes mistaken for tarantulas. Wolf spiders live mostly solitary lives. They are hunters and have excellent eyesight. Insects and other invertebrates make up their diet. Their 8 eyes are arranged in 3 rows: the front row has 4 small eyes, the middle row has 2 large eyes, and the back row has 2 medium eyes. The eyes reflect light, so they can be easily found at night with a flashlight. 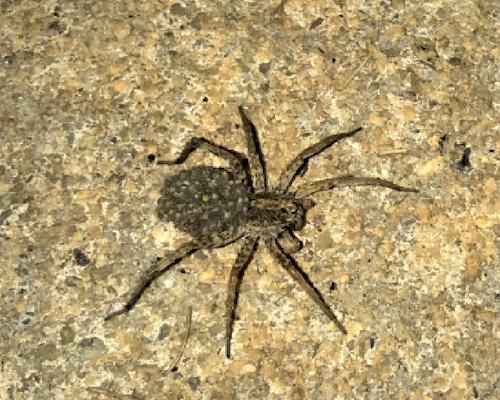 Bites from wolf spiders are rare and they are not dangerous to humans. Symptoms of a bite include swelling, itching, and mild pain. Outdoors, wolf spiders are found in a variety of habitats, but they are most common in grasslands, meadows, and fields. They can also be found beneath stones or other items. To help keep them away, limit the amount of ground-covering vegetation near your home. Keep them outdoors by sealing up cracks and holes in the outside of the house. Make sure there are tight-fitting screens on all attic and foundation vents. Also, seal around all pipe lines. The largest species of wolf spider in the United States is the Carolina Wolf Spider. It was named South Carolina’s official state spider in 2000. Wolf spiders do not build webs. They hide under rocks or other objects when they are not hunting. Some species even burrow into the soil. The egg sacs of wolf spiders are attached to the spinnerets, or structures that produce silk, at the end of the abdomen. After hatching, the young spiderlings continue to ride on their mother until partially grown.